Cytotoxic T lymphocytes are critical participants in viral immunity. One of their major roles is the destruction of infected cells via cytolytic granules containing lytic proteins, including perforin (Pfp)3 and granzyme (Gzm) serine protease family members. Pfp is critical for protease delivery, whereas Gzms initiate proteolysis and trigger apoptotic pathways (1). Individual virus-specific CTL express heterogeneous patterns of Pfp and specific Gzm family members (2, 3). This unique cytolytic profile is the outcome of specific transcriptional regulation of the different lytic proteins (3, 4). In response to virus, CD8+ T cells acquire effector function, including the expression of cytotoxic molecules. Once virus is cleared, memory CTL reside in lymphoid organs and peripheral tissue(s) associated with infection. Memory CTL are considered to maintain cytolytic molecule transcription as a means of Ag preparedness. Lymphoid-resident memory CTL express some cytolytic transcripts, although at reduced levels compared with peak immunity (2, 5, 6). Little to no cytolytic protein is expressed (5, 7, 8), which avoids the dangerous scenario of improper cytolytic molecule release. Cytolytic transcription by tissue-resident memory CTL has not been examined. These cells display potent cytolytic function (8, 9, 10) and are predicted to display activated cytolytic transcriptional profiles. In this study, we investigated cytolytic transcriptional profiles using two models of anti-viral CTL immunity; infection of the respiratory tract with influenza A virus and infection of the skin epidermis with HSV-1. Together, these models provide lymphoid-resident (spleen) and tissue-resident (lung, skin, and dorsal root ganglia (DRG) virus-specific CTL. Cytolytic transcriptional profiling of single CTL showed that both lymphoid and tissue-resident memory CTL expressed reduced cytolytic transcription unless localized Ag was present. C57BL6/J (B6), C57BL6/J-TgN(TCR-HSV)gBT-I.1Frc (gBT-I), and gBT-I × B6.SJL-PtprcaPep3b/BoyJ (gBT-I × B6.Ly5.1) mice (gBT is gB-specific CTL) were maintained at the Department of Microbiology and Immunology, University of Melbourne (Parkville, Victoria, Australia). The gBT-I TCR transgenic mice are specific for the H-2Kb-restricted HSV-1 epitope gB498–505-SSIEFARL (gB) (11). B6 mice were adoptively transferred with 5 × 104 gBT lymph node cells i.v. before infection. Mice were inoculated with 1 × 106 PFU of HSV-1 (KOS strain) in a region of scarified flank skin or with intranasal administration of 50 PFU of flu-gB. At days 7–8 (acute) and days 20–21 (late) following infection, spleen, lung, skin, and DRG were harvested. Lymphocytes were isolated by mechanical disruption or collagenase (Roche) digestion. Cells were stained with anti-CD8α-allophycocyanin and anti-Ly5.1-PE (BD Pharmingen). CD8+Ly5.1+ cells were sorted into individual wells of a 96-well plate (Eppendorf) by using a FACSAria flow cytometer with a single cell deposition unit (BD Biosciences). cDNA was generated and two rounds of nested PCR were performed (2, 3). Samples that were not CD8α-positive were excluded from the analysis; the data was analyzed with Student’s t test. Cytolytic transcriptional profiling of CTL responding to HSV-1 and/or influenza was undertaken by single cell RT-PCR (2, 3). The frequency, number, and pattern of Pfp and Gzms A, B, C and K were assessed. To allow direct comparison between the two viruses, we used an engineered influenza virus expressing the HSV-1 gB epitope, gB498–505 (flu-gB) (12). gB-specific CTL were studied upon the adoptive transfer of low numbers (5 × 104) of Ly5.1+ gBT (gBT) before infection. This enabled CTL isolation without MHC class I tetramer reagents that might trigger the TCR and inadvertently alter cytolytic granule composition. Naive gBT did not express cytolytic transcripts (data not shown). We determined whether cytolytic transcription was intrinsic or modulated by different viral infection contexts. In support of the latter, Gzm A (13) and Gzm B-deficient mice (14) display increases in HSV-1 susceptibility, whereas influenza elicits robust CTL immunity in the absence of Gzm A and/or Gzm B (15). Given this, we predicted an increase in CTL using Gzm A during HSV-1 infection compared with influenza. gBT were isolated from spleens following infection with either flu-gB or HSV-1 at acute (days 7–8) time points. For both viruses, this is the peak in CTL magnitude. Flu-gB and HSV-1-specific gBT expressed the same range of cytolytic phenotypes; 14 different patterns were observed (Fig. 1⇓). 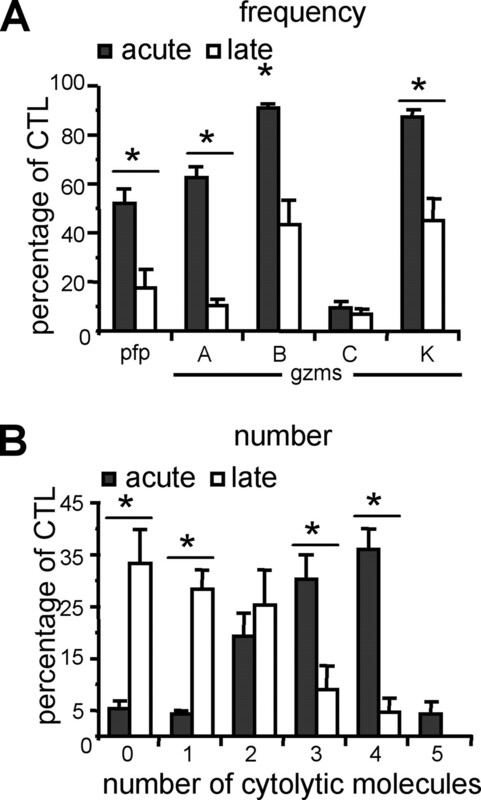 For both infections, the prevalent phenotype was a combination of Pfp and Gzm A, B, and K. Few virus-specific CTL expressed Gzm C, confirming a limited role for Gzm C in viral immunity in vivo (2, 3) despite it being highly expressed in activated CTL in vitro (4). Some differences were noted. Flu-gB elicited a higher frequency of gBT expressing either Gzm B or Gzm K alone, however these cells represented only minor populations overall. In response to both viruses, gBT expressed similar numbers of cytolytic transcripts per cell, where the mean number expressed per flu-gB-specific gBT was 2.9 ± 1.3 (n = 144) compared with 2.5 ± 1.4 (n = 76) for HSV-1-specific gBT. Therefore, cytolytic transcriptional profiles elicited by the distinct viruses were similar, heterogeneous, and resembled those described previously for endogenous influenza-specific CTL (2, 3). Specifically, there was no increase in the prevalence of Gzm A-expressing CTL in response to HSV-1 vs flu-gB infection. This suggests that CTL cytolytic transcription is determined intrinsically rather than being modulated by the specific viral infection context. This does not rule out, however, the possibility that cytolytic transcriptional profiles may differ when examining CTL responses to other pathogens or, indeed, other foreign Ags (e.g., tumor cells). Previous studies by our laboratory showed that endogenous influenza-specific memory CTL in the spleen down-regulate cytolytic transcription compared with transcription during peak immunity (2). We determined whether this was also the case for spleen-resident memory CTL following flu-gB infection. 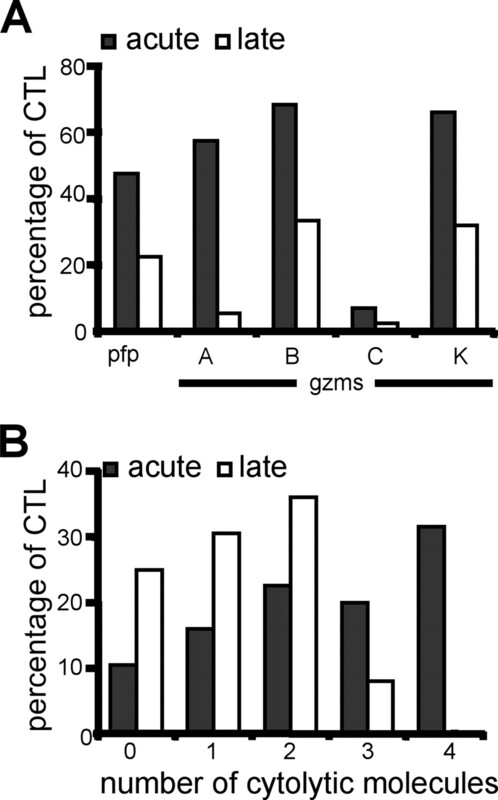 Following acute infection, a high frequency of gBT expressed Pfp, Gzm A, Gzm B, and Gzm K (Fig. 2⇓A). In contrast, at late time points a reduced frequency of flu-gB-specific gBT expressing cytolytic transcripts was detected in Gzm A- and Gzm K-expressing CTL (Fig. 2⇓A). The failure to maintain Gzm A expression supports previous studies (2, 5) but contrasts with human studies where memory CTL acquire Gzm A (16). This provides further evidence that mouse and human Gzms are structurally and functionally divergent (17). At acute time points 31.5% of flu-gB-specific gBT expressed four cytolytic transcripts per cell, whereas at late time points no flu-gB-specific CTL were detected that expressed four cytolytic transcripts per cell (Fig. 2⇓B). This was reflected in the significant reduction (p < 0.05) in the mean number of cytolytic transcripts expressed per CTL at late time points: 1.0 ± 1.1 (n = 90) compared with 2.5 ± 1.4 (n = 76) at acute time points. Therefore, on a per cell basis spleen-resident flu-gB-specific memory CTL expressed reduced cytolytic molecule transcripts at late time points compared with peak immunity. It should be noted that memory CTL do not resemble naive CD8+ T cell precursors that lack cytolytic molecule expression altogether. In all cases, a considerable frequency expressed Gzm B and/or Gzm K (Fig. 2⇓). These may simply represent longer lived mRNA transcripts or, alternatively, these Gzms may possess functions important for memory CTL other than the cytolysis of infected cells. This requires further investigation. Of interest was the cytolytic transcriptional profiles of influenza-specific memory CTL resident in the respiratory airways. To examine this, flu-gB-specific gBT were harvested from the respiratory tissue at acute (days 7–8) vs late (days 20–21) time points. At late time points following flu-gB infection, a reduced frequency of flu-gB-specific gBT expressing cytolytic transcripts was detected in Pfp-expressing CTL compared with peak immunity (Fig. 3⇓A). 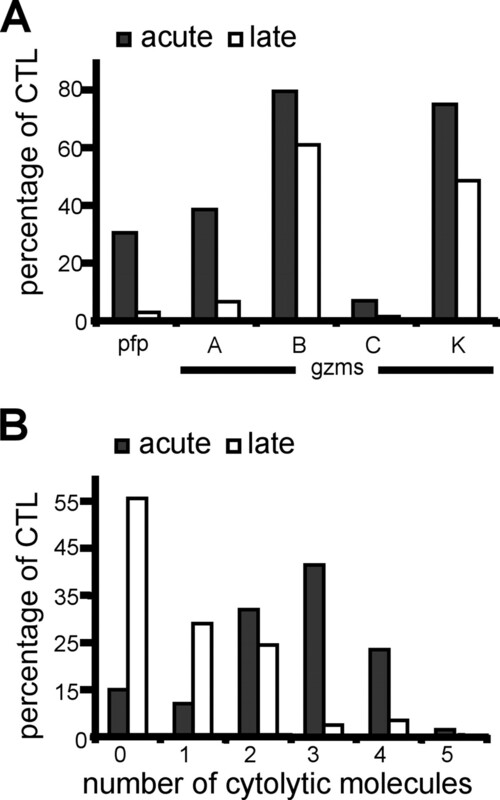 More than 50% of CTL examined at late time points did not express any cytolytic transcripts at all, with fewer CTL expressing three cytolytic transcripts per CTL compared with acute time points (Fig. 3⇓B). A significant reduction (p < 0.05) in the mean number of cytolytic transcripts expressed per CTL at late time points was observed: 1.3 ± 0.9 (n = 57) compared with 2.5 ± 1.2 (n = 66) at acute time points. Therefore, on a per cell basis lung-resident flu-gB-specific memory CTL expressed reduced cytolytic molecule transcripts at late time points compared with peak immunity. Despite expressing an activated phenotype (18), memory CTL residing in the lung parenchyma down-regulate their cytolytic molecule transcription. This implies that influenza A virus Ag is no longer present and provides no support for the recent notion that influenza Ag persists in long-lived depots (19). More importantly, this data suggests that tissue-resident memory CTL are similar to lymphoid-resident memory CTL in that they do not express high levels of cytolytic transcripts. HSV-1 infection of skin epidermis (20, 21) provided a distinct anatomical location (skin) for examining tissue-resident memory CTL. This was important, as the down-regulation of cytolytic transcription by lung-resident memory CTL may result from the environmental milieu present in respiratory airways. In brief, HSV-1 infection involves skin inoculation, virus access to the sensory neurons, and virus re-emergence to promote a skin zosteriform lesion. The virus is cleared from the skin by day 7 (20) but establishes a persistent reservoir of latent virus in the DRG (22). To investigate cytolytic transcription in skin-resident HSV-1-specific CTL, gBT were isolated at acute (days 7–8) vs late (days 20–21) time points following HSV-1 infection. Pfp and Gzm A, B, and K were expressed by a high frequency of skin HSV-1-specific gBT CTL during acute infection. In contrast, all cytolytic transcripts were represented at significantly reduced (p < 0.05) frequencies at late time points (Fig. 4⇓A). As such, a dramatic down-regulation in the number of cytolytic transcripts expressed per cell was detected for skin HSV-1-specific gBT (Fig. 4B⇓). At late time points, gBT expressed 1.2 ± 1.2 (n = 153) cytolytic transcripts per cell, significantly reduced (p < 0.05) from the acute response where gBT expressed 3.0 ± 1.1 (n = 146) cytolytic transcripts per cell. Therefore, similar to the lung, memory CTL that reside in the skin following virus clearance display reduced cytolytic transcription compared with peak CTL immunity. A unique feature of HSV-1 infection is that it provides a source of tissue-resident CTL localized to DRG. In this site, latent HSV-1 provides continuous stimulation of resident CTL by infected parenchymal cells (22). Therefore, a direct comparison of tissue-resident CTL that persist in the presence (DRG) or absence (skin) of Ag could be undertaken. CTL resident in neuronal cell bodies were also of interest, given that although they are reported to display an activated phenotype, including expression of Gzm B protein (22, 23), they are not considered to use cytotoxic mechanisms to combat virus infection (24). HSV-1-specific gBT were isolated from DRG innervating the HSV-1 inoculation site during both acute (days 7–8) and late (days 20–21) CTL immunity. A high frequency of DRG HSV-1-specific gBT isolated at both time points expressed Pfp and Gzm A, B, and K (Fig. 5⇓A). 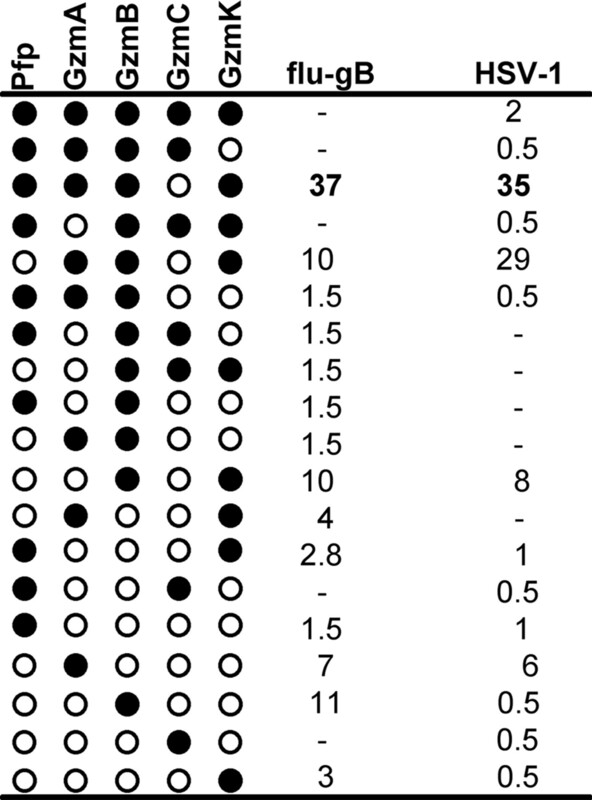 At both time points, the percentage of gBT expressing one, two, three, and four cytolytic transcripts per CTL was similar (Fig. 5⇓B). 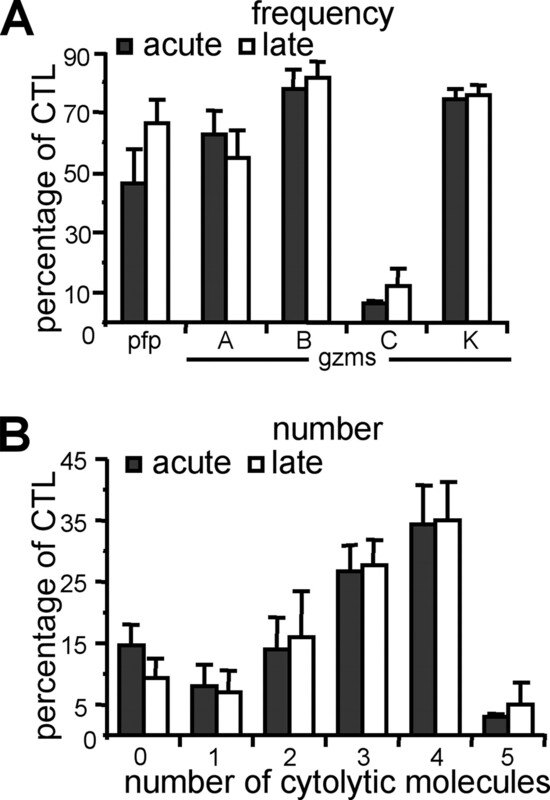 This was also the case for the mean number of cytolytic transcripts expressed per cell: DRG-resident gBT expressed 2.7 ± 1.5 (n = 151) transcripts at acute time points compared with 2.8 ± 1.3 at late time points. Therefore, for DRG-resident HSV-1-specific gBT, similar cytolytic transcriptional profiles were observed at both acute and late time points following infection. This has a number of implications. First, the inhibition of cytotoxic function reported for DRG-resident CTL (24) does not involve the termination of transcription of Pfp, Gzm A, Gzm B, and/or Gzm K. Second, latent HSV-1 is capable of eliciting a similar cytolytic transcriptional program to acute HSV-1 infection. Third, when DRG-resident CTL are compared with skin-resident CTL at the same time points (Fig. 4⇑), it is apparent that cytolytic transcription is maintained only in the presence of ongoing localized Ag expression. In summary, our assessment of CTL cytolytic transcriptional profiles over the course of viral immunity suggests that, unless persisting Ag is present, anti-viral memory CTL decrease their cytolytic transcription regardless of whether the CTL remain localized at the site of former infection or the lymphoid tissue. Therefore, tissue-resident memory CTL are no more poised for cytotoxic effector function than their lymphoid counterparts despite possessing the capacity to initiate rapid cytotoxicity (7, 8, 9, 10). The inability to sustain the transcription of cytolytic molecules in the absence of localized Ag suggests this is tightly regulated and requires an Ag-specific signal via the TCR. This differs from the expression of activation markers such as CD69, which can be elicited in response to inflammatory stimuli in the absence of Ag (22). Overall, this analysis suggests that the selective advantage memory CTL possess, when compared with their naive CD8 T cell precursors, is due to increased frequency and/or anatomical distribution in sites of potential reinfection but is not due to enhanced cytotoxic capacity. We thank Nicole La Gruta, Katherine Kedzierska, and Thomas Gebhardt for critical review of the manuscript, Dina Stockwell and Lauren Kleinhert for technical assistance, and Ken Field for excellent flow cytometry. ↵1 J.D.M. was supported by a National Health and Medical Research Council (NHMRC; Australia) C. J. Martin Fellowship; C.G. was supported by a Marie Curie Outgoing International Fellowship; F.R.C. was supported by NHMRC (Australia); P.C.D. was supported by a NHMRC (Australia) Burnet Grant; and S.J.T. was supported by a NHMRC (Australia) R. D. Wright Fellowship. ↵3 Abbreviations used in this paper: Pfp, perforin; Gzm, granzyme; DRG, dorsal root ganglia, gBT, gB-specific CTL. Voskoboinik, I., M. J. Smyth, J. A. Trapani. 2006. Perforin-mediated target-cell death and immune homeostasis. Nat Rev Immunol. 6: 940-952. Jenkins, M. R., K. Kedzierska, P. C. Doherty, S. J. Turner. 2007. Heterogeneity of effector phenotype for acute phase and memory influenza A virus-specific CTL. J. Immunol. 179: 64-70. Kelso, A., E. O. Costelloe, B. J. Johnson, P. Groves, K. Buttigieg, D. R. Fitzpatrick. 2002. The genes for perforin, granzymes A-C and IFN-γ are differentially expressed in single CD8+ T cells during primary activation. Int. Immunol. 14: 605-613. Peixoto, A., C. Evaristo, I. Munitic, M. Monteiro, A. Charbit, B. Rocha, H. Veiga-Fernandes. 2007. CD8 single-cell gene coexpression reveals three different effector types present at distinct phases of the immune response. J. Exp. Med. 204: 1193-1205. Wherry, E. J., V. Teichgraber, T. C. Becker, D. Masopust, S. M. Kaech, R. Antia, U. H. von Andrian, R. Ahmed. 2003. Lineage relationship and protective immunity of memory CD8 T cell subsets. Nat. Immunol 4: 225-234. Mueller, S. N., W. Heath, J. D. McLain, F. R. Carbone, C. M. Jones. 2002. Characterization of two TCR transgenic mouse lines specific for herpes simplex virus. Immunol. Cell Biol. 80: 156-163. Stock, A. T., C. M. Jones, W. R. Heath, F. R. Carbone. 2006. CTL response compensation for the loss of an immunodominant class I-restricted HSV-1 determinant. Immunol. Cell Biol. 84: 543-550. Pereira, R. A., M. M. Simon, A. Simmons. 2000. Granzyme A, a noncytolytic component of CD8+ cell granules, restricts the spread of herpes simplex virus in the peripheral nervous systems of experimentally infected mice. J. Virol. 74: 1029-1032. Heusel, J. W., R. L. Wesselschmidt, S. Shresta, J. H. Russell, T. J. Ley. 1994. Cytotoxic lymphocytes require granzyme B for the rapid induction of DNA fragmentation and apoptosis in allogeneic target cells. Cell 76: 977-987. Mullbacher, A., P. Waring, R. Tha Hla, T. Tran, S. Chin, T. Stehle, C. Museteanu, M. M. Simon. 1999. Granzymes are the essential downstream effector molecules for the control of primary virus infections by cytolytic leukocytes. Proc. Natl. Acad. Sci. USA 96: 13950-13955. Takata, H., M. Takiguchi. 2006. Three memory subsets of human CD8+ T cells differently expressing three cytolytic effector molecules. J. Immunol. 177: 4330-4340. Kaiserman, D., C. H. Bird, J. Sun, A. Matthews, K. Ung, J. C. Whisstock, P. E. Thompson, J. A. Trapani, P. I. Bird. 2006. The major human and mouse granzymes are structurally and functionally divergent. J. Cell Biol. 175: 619-630.
van Lint, A., M. Ayers, A. G. Brooks, R. M. Coles, W. R. Heath, F. R. Carbone. 2004. Herpes simplex virus-specific CD8+ T cells can clear established lytic infections from skin and nerves and can partially limit the early spread of virus after cutaneous inoculation. J. Immunol. 172: 392-397. Simmons, A., A. A. Nash. 1984. Zosteriform spread of herpes simplex virus as a model of recrudescence and its use to investigate the role of immune cells in prevention of recurrent disease. J. Virol. 52: 816-821.